Alexei’s production function, represented graphically in Figure 1, describes how his daily hours of study translate into his final grade. We have seen that his marginal product at each point is the slope of the function, and his average product is the slope of the ray to the origin. Now we look at how to describe the marginal and average products mathematically. Figure 1 How does the amount of time spent studying affect Alexei’s grade? where is the final grade (his output) and is hours of study per day (the input). is the production function. 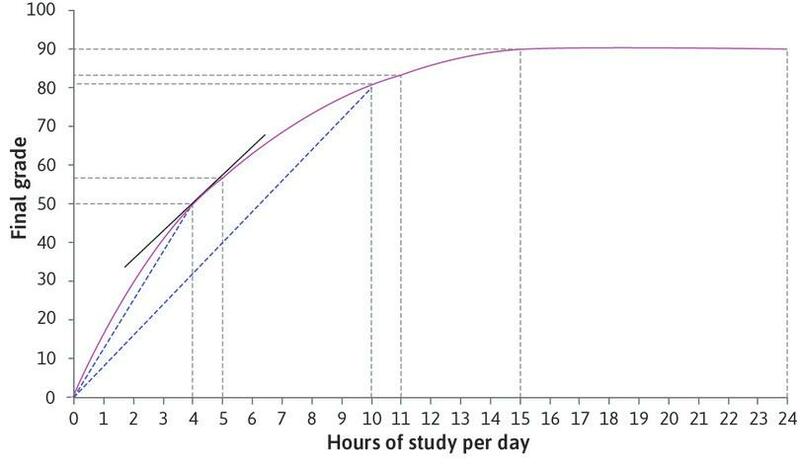 This is the average number of grade points per hour of daily study. In the diagram, it is the slope of the ray to the origin. We have defined Alexei’s marginal product of labour (MPL) as the increase in his grade from increasing study time by one hour. More precisely, it is the rate at which his grade increases as study time increases, which corresponds to the slope of the production function.